Scenario painting: SMM could see a huge loss in 2016 (apart from a loss in 4Q15) from the impact of cancelled Sete Brasil orders and rig value write-down. The negative impact on Keppel would be more muted. Moreover, Keppel has the benefit of sizeable earnings from its property business. As for SCI, even assuming zero value for SMM, its valuation is above current share price. We lower our target prices but our stock calls are unchanged. • Petrobras may reduce Sete Brasil rig orders to 6 from 15. According to Brazilian news wire Estadao, Petrobras may further reduce Sete Brasil’s rig orders from 15 to 6 only. The six will comprise units currently in advanced stages of construction, with the remainder to be cancelled. The nine rigs cancelled will be replaced by rigs acquired from the secondary market. At this juncture, this decision is not confirmed as negotiations are still ongoing. Keppel Corp (Keppel) and Sembcorp Marine (SMM) are building six and seven rigs respectively for Sete Brasil. Based on the latest construction status report from Sete Brasil, Keppel has five rigs that have started construction, while SMM has four rigs. Among these, two from Keppel and three from SMM are in advanced stages of construction (>50%). 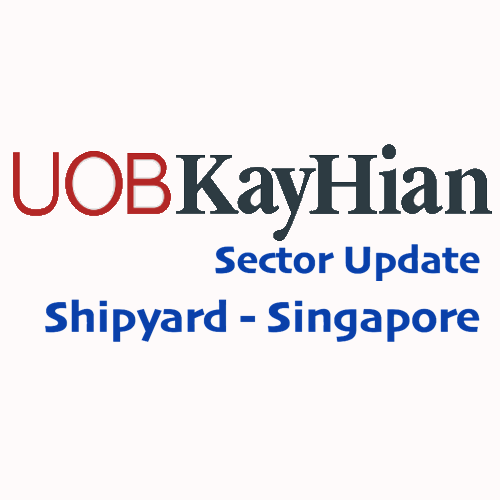 We believe that should the reduced orders go ahead, these five units will likely form part of the six rigs to be retained, leaving Keppel with three rigs and SMM two rigs without an owner. • Both shipyards have consistently reiterated that they are cash positive in these contracts. They have received deposits for rigs that have yet to commence building as well as milestone payments for rigs that are under construction. Thus, we expect minimal earnings reversal relating to the unbuilt units should their orders get scrapped. However, we would have to lower our earnings forecasts in view of a loss of future revenue from the unbuilt rigs. Keppel’s total contract wins of S$1.8b in 2015 is shy of our S$2b assumption. SMM’s total contract wins of S$3.0b in 2015 surpassed our S$2.5b assumption. We estimate provisions of S$32m and S$95m in 4Q15 with respect to the Iron V and the West Rigel rigs respectively. We had earlier assumed total provision of S$75m in 4Q15. We now raise it to S$127m. SMM had issued a profit warning in early December, expecting to make a loss in 4Q15. For 2015, net profit is expected to see a significant decline. The loss for 4Q15 is attributed to a "challenging operating environment and customers deferring or seeking to defer their rig orders". SMM had terminated Marco Polo Drilling’s (MPD) Iron V jack-up rig contract on 1 Dec 15, and will seek payment of the secpnd disbursement of US$21.4m from MPD’s guarantor Marco Polo Marine (MPM). Simultaneously, SMM took legal action against MPM in the Singapore High Court on 1 Dec 15. SMM also announced it and NAD had arrived at a standstill agreement until Jun 16. Under the agreement, NAD will continue to market the rig but with SMM retaining the right to sell it. Upon expiry of the agreement, both parties will form a 23:77 (NAD:SMM) joint asset holding company to market or sell the rig West Rigel. Taking into account factors such as provisions and Sete Brasil’s partial order cancellation, we estimate the earnings impact would be large. Our net profit forecasts will be reduced by 7-11% for Keppel, while SMM could swing into a big loss in 2016, based on our worst-case scenario (scenario 3). • Revising 2016 oil price assumption to US$54/bbl. Our monthly tracking of 28 forecasts from banks and oil agencies showed a >5% change in consensus average, declining from US$57 to US$54/bbl. Accordingly, we revise our 2016 oil price assumption to US$54/bbl. We also start our 2017 Brent oil price assumption at US$62, the consensus average of 21 forecasts. Datapoints for the 2017 assumption are lower as not all agencies have provided their 2017 forecasts. With 2016 kick starting another oil price rout, we expect a second round of forecast downgrades which will shift our 2016 Brent oil assumption further south. As such, we maintain our 2016 Brent oil price assumption of US$60/bbl for now, but will re-visit our assumption next month after the various agencies have revised their forecasts. More contracts are being cancelled while oil prices have sunk to a lower level. Keppel and SMM currently trade at 2016F P/B of 0.9x and 1.0x respectively. Stock valuations have fallen below 2008-09’s recession levels. South Korean and Japanese offshore heavy-engineering shipyards are trading at lower 2016F P/B of 0.6x. To recap, Keppel’s and SMM’s premium valuations started in 2004 on the back of the oil supercycle. Worth noting is prior to 2004, SMM - a pure shipyard - traded at a lower average P/B of 1.26x (1997-2003). Then, it was primarily a ship-repair yard. While its earnings capability was lower, SMM’s ship-repair business was low risk. Its current offshore heavy-engineering business is inherently higher risk. During the Asian Financial Crisis (AFC), SMM’s P/B valuation crashed to 0.85x. • Maintain SELL on SMM, and lower target price from S$1.69 to S$1.05. We now value SMM at 0.85x 2016F P/B from 1.2x in line with AFC trough valuation of 0.85x. • Lowering our target price for SCI from S$4.05 to S$3.60. Factoring in our lower target price of S$1.06 for SMM, our revised SOTP valuation for SCI is S$3.60, based on a 2016F PE of 12x for its utilities business. If we were to hypothetically ascribe an unlikely case of zero value for SMM, SCI’s valuation would be S$2.85/share which is still above its last share price of S$2.76. Maintain BUY on SCI, but we remove it from our top buy list in view of the short-term headwinds. We have also lowered our target price from S$7.60 to S$6.30. We reduce our 2016F P/B benchmark from 1.7x to 0.85x although its marine business is in better shape than SMM’s.